Where can I download the free mosquito ring tones? Go to Mosquito Ring Tones and test out each of the tones by clicking on them to see if you can hear it. Right Click on the highest tone you can reliably hear and select "Save Target As"(if you are using IE or netscape) or "Save Link As"(if you are using firefox) Click OK button in the next dialog window and it should download the tone to your computer. I can’t hear any of the ringtones! Try playing this tone: 8khz MP3 Tone -If you can’t hear it, then try playing some other sounds (i.e. music, movies, Youtube, etc…) through your computer to make sure the sound system in your computer is working properly and is at a high enough volume that you can comfortably listen to sounds on. This also makes sure that the speakers aren’t muted on your computer. If this doesn’t fix it, then there might be something wrong with the sound system in your computer or you don’t have an audio player associated with your browser or the specified sound type that can handle these sounds. On some computer sound systems, if you turn the volume too high, it will introduce a level of distortion which is very loud and can be heard by people of all ages. Try using this tone: 8khz MP3 Tone to fine tune the volume level of your computer sound system. Reduce the volume on your computer so that you can barely hear the higher range ringtones but can still hear the 8khz tone clearly. I can’t hear the higher range tones, How can I make sure that the tone is even playing? Download one of the tones you are having problem with and try to play it in the windows media player. In the player, go to View > Visualizations > Bars and Waves > Bars. 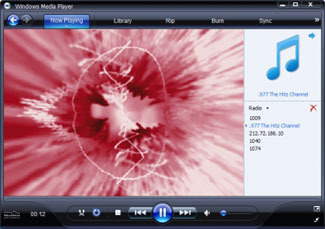 After doing so, try to play the tone in the windows media player and you should see some kind of visual cue indicating the sound being played in the audible spectrum. This way you know for a fact that the ringtone is being played. If you didn’t pick a tone that is totally out of your audio range and the room you are playing it is quiet, and you concentrate on listening at the time you are playing it, you might be able to hear a really high pitch sound (kinda like an old CRT/tube TV or monitor turning on back in the days before flat panel monitors) or you might feel a little bit of pressure in your head. Why can’t I hear the really high frequency tones? Just as people become less flexible as they get older, your ear drum and inner ear becomes less active as you get older. It’s a proven medical fact that the older you get, the less likely it is that you are going to hear the extremely high frequency sounds. Kids & teens can hear the mosquito ringtones easily because their ear drums are more flexible and their inner ear is more active so they are capable of hearing higher frequency vibrations of sound. If you enjoy cranking up your music very loudly or live / work in a place with lots of loud noises or sounds, your hearing may have been damaged over time and your sensitivity to higher frequency sounds will go down. Obviously, you wont hear the high frequency tones with any kind of reliability if you try to hear them over a noisy environment. Having the speakers on your cell phone blocked by a pouch or purse also reduces the ability for you to hear it as high frequency sounds do not travel well through barriers. Not all speakers are designed to reproduce high frequency sounds well. Cell phone speakers come in various qualities and some are good and others are bad. A good quality speaker will be able to produce high frequency sounds with consistent volume. But, the efficiency of poor quality speaker will drop off at higher frequencies and results in lower volume. Modern computer’s should support a sound system that is capable of reproducing these tones. However, older and poor quality speakers may have some problems reproducing these sounds properly.